Yay AK!!! Enjoy your wonderful $20 gift certificate to Swirl Wine! Swirl Wine Gift Certificate Giveaway!! - LAST DAY TO ENTER! Don't forget to get your last vote in TODAY for a chance to win a $20 gift certificate to Swirl Wine in Timonium. Just leave a comment on this post telling me what kind of wine you like. The contest ends TONIGHT at 11:59PM! Last weekend, I had the absolute pleasure of going to The Casual Cup in Phoenix for a 2 hour tea tasting. We tried a white tea, two types of green teas, a black tea (assam) and a rooibos "tea" (it's not really tea since the leaves come from the African Red Bush). The wonderful owner, Wendy Savelle, paired our teas with delights from the kitchen - scones, quiche, lemon bars. Everything was absolutely delicious! More than that, it was just so much fun to learn about tea and to try all different kinds! I met the loveliest ladies and learned about the Royal Tea Club - a group who meet up for Tea at various tea rooms in Maryland and Pennsylvania, and sometimes England!!!! I realized that once I finish all the million teabags that I have left in my kitchen, I will tread softly into the Wonderful World of Loose Leaf Tea. 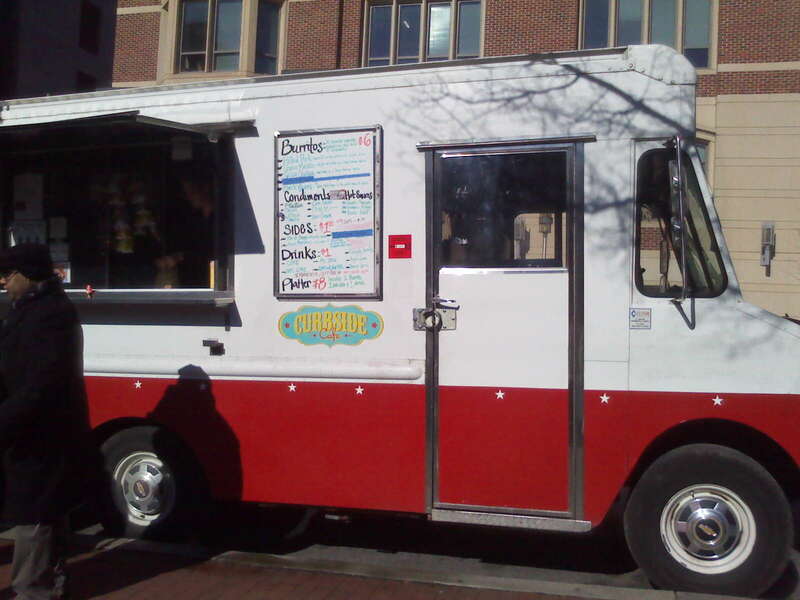 Curbside Cafe is our local burrito truck and I love it SO MUCH!!!! I heard really great reviews about the spicy chicken burrito, so I decided to give that a shot the first time I stopped by the truck. I got the platter for $8 - burrito, a choice of a side and a drink. Or you can order a burrito by itself for $6, a side for $1.50, and a drink for $1. The chicken is a pulled chicken with a spicy sauce that can easily be masked by the cheese, sour cream, or avocado (if you want it to be masked). 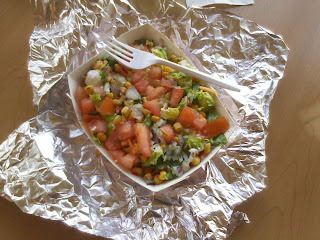 It was also WOH DELICIOUS. If you aren't into spicy food - don't let that scare you away from trying this burrito. However, their other burrito choices include chana masala (chickpeas in Indian spices), pulled pork, grilled veggies, black beans and steak burritos. For my side, I chose the fried plantains seasoned with salt and pepper. These aren't your usual fried plantains, as you can see from the picture. 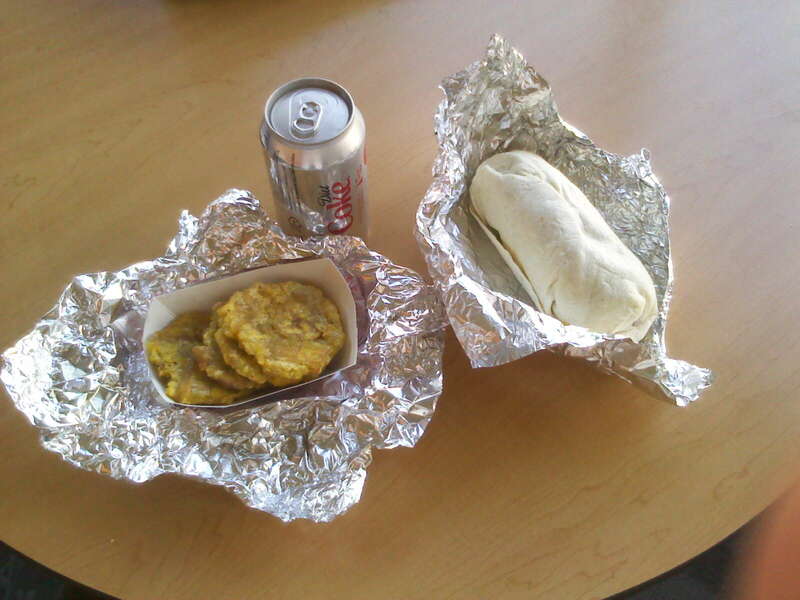 They are actually tostones and they are excellent, but honestly, the burrito was big enough that I really didn't need to have the platter. However, I would consider purchasing these separately if I just wanted a snack one day. Love. The next time the truck came by, I chose the spicy chicken burrito bowl, to save myself some calories, plus it was only $5, which is a steal for a flavorful and VERY filling lunch!!!! I can't wait to keep going back! Don't forget to enter my $20 gift certificate giveaway to Swirl Wine shop in Timonium! You can enter once per day until Feb 25th! Good morning! Wow, I am super excited about today's weather. I am not excited that I'll be inside for the most of it staring at a computer, but I am determined to enjoy my lunch hour and take a walk. I think I'll head to the harbor for a nice break in scenery. A smoothie is also calling my name. Hmmmmm where should I go? I want a fruit and yogurt based smoothie - any suggestions in the downtown area? Also - don't forget to enter my $20 gift certificate giveaway to Swirl Wine shop in Timonium! You can enter once per day until Feb 25th! Do you like wine, beer and/or liquor? Do you like winning things? Well then get excited friends because I have an AWESOME giveaway for you! Swirl Wine is offering one lucky TofB reader a $20 Gift Certificate to their store in Timonium!!!! I've written about Swirl a number of times, so this is very exciting for me! What I've always loved about Swirl, is the enthusiasm the owners (husband and wife team, Austin and James) have for teaching others about wine. They offer wine classes, as I mention below, and they also hold wine tastings on Friday evenings. Here are their two upcoming classes ($20 each). I've taken Swirl 101 before with a friend of mine and not only did we learn a lot, but we had a blast! Geared toward the new wine enthusiast. Popular styles, regions, and terminology will be explored. Each "Nitty Gritty" class will be centered around an in-depth investigation of a particular region, varietal, or style. The dynamic region of Spain will be on the agenda for this class. So drop by Swirl, and enter my giveaway! You can enter ONCE PER DAY! - One winner will receive a $20 gift certificate to Swirl Wine. The certificate may be redeemed for in-store purchases, including wine classes. - This giveaway will end on Friday, February 25th at 11:59PM. - I will choose the winner by random selection on February 26th and I will notify them via email and via a blog post! Every year Dan and I agree not to celebrate Valentine's Day, and every year without fail he still gives me a present - usually a box of chocolates from Cacao Lorenzo (which is my favorite chocolatier IN THE ENTIRE WORLD - review forthcoming!). This year, Dan told me he was taking me out to a surprise dinner, so I was already super excited about that. But then last night, he surprised me a little early with my present - tickets to see Alton Brown at the Hippodrome!!!!!!!!!!!! OMG OMG OMG I AM SO EXCITEDDDDDDDDDD!!!! ALTON!!!!!! THE FOODIE EXPERIENCE!!!!!! Yay! Dan is super awesome!!!!!!!!!! Here are some press releases I've received lately. As always, feel free to send me press releases if you would like me to post information. I try not to do complete lists, as they are usually pretty exhaustive elsewhere. 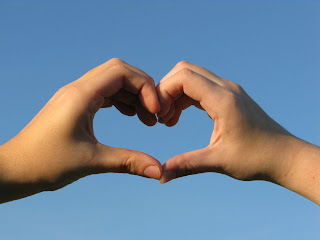 For more Valentine's Day information, check this list out on Dining@Large. Crush Restaurant is celebrating Valentines day by offering a special 3 course Pix Fixe menu for $50. Diners may also choose from a limited a la carte menu. Morton’s The Steakhouse in Baltimore is celebrating Valentine’s Day weekend, February 11 – 14, with a special three-course menu for two, as well as a Valentine’s Day cocktail, The Red Velvet. In addition, pair the meal with a bottle of 2007 Beringer, Napa Valley, Pinot Noir, or 2008 Beringer, Napa Valley, Sauvignon Blanc, for an additional $45. Phillips Seafood Restaurant - Harborplace is offering a three-course Valentine's Day Menu for $48 per person, available from February 11-14. The regular menu will also be available a la carte. On February 24th at 6:30pm, the Maryland Science Center's wine series, Science Uncorked, returns with "Que Syrah, Shiraz." Participants will explore how climate and soil affect how wines taste and sip samples of wines to understand their taste differences. The Wine Market's Wine Director, Lucien Walsh, will lead the discussion and presentation. There will be food available. Tickets for Science Uncorked are $50 ($45 for Maryland Science Center members) and are all inclusive–wine, food and program. What is the difference between crab claw meat and jumbo lump crab meat? Enjoy a tasting of the various grades of crab meat with a glass of wine and a demonstration on how to make your own hors d'oeuvres. Clam Bake for Two. Saturday, April 16. Learn how to shop for fresh seafood, select it and whip up an easy one-pot meal. Then they’ll show you how to combine it all to create a clam bake that includes a whole Maine lobster, snow crab legs, shrimp, clams, mussels, potatoes and corn on the cob. The Freshest Catch. Saturday, May 7. Salmon. Barramundi. Flounder. Mahi-mahi. It’s all so good. But how do you select it, clean it, grill it, or stuff it with crab? Enjoy lunch, wine, and discuss all the intricacies of a great meal with the chef. Each class costs $50 and it includes the chef demo, wine, lunch, and a swag bag to go. Get three classes for $125. Classes begin at 11:30, and space is limited, so register early. Call the restaurant to register. Although Slainte (pronounced Slawn-Cheh) Irish Pub and Restaurant has been around for more than five years, it's recently had a menu overhaul in an effort to make the place more like a gastropub, thanks to the hiring of Chef Bill Crouse. I was so happy to receive an invitation to taste the new menu! I didn't really know what to expect, but I assumed traditional Irish fare, however it was so much more than that. By the end of the meal I was completely blown away by each item I tried. I love when my expectations are surpassed! 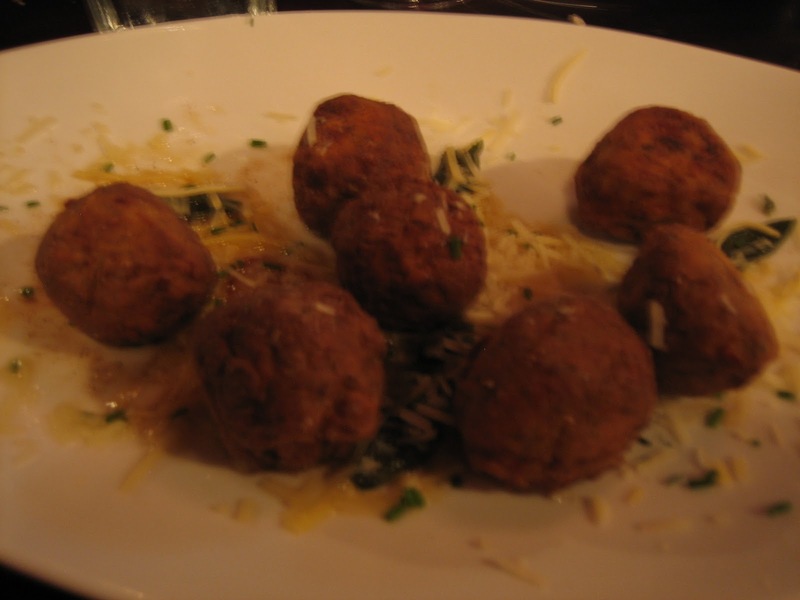 Mushroom Gnudi (Gnocchi) $9 - Mushroom gnocchi fried golden and served with brown butter and sage. These are not like your typical potato gnocchi - it tasted more like a deep fried ball of mushroom risotto. Doesn't that sound good!? They are so incredibly creamy and cheesy. To all those mushroom haters - you can hardly tell they are in this dish, don't let it deter you from trying this. OMG I want five million more of these within my reach. 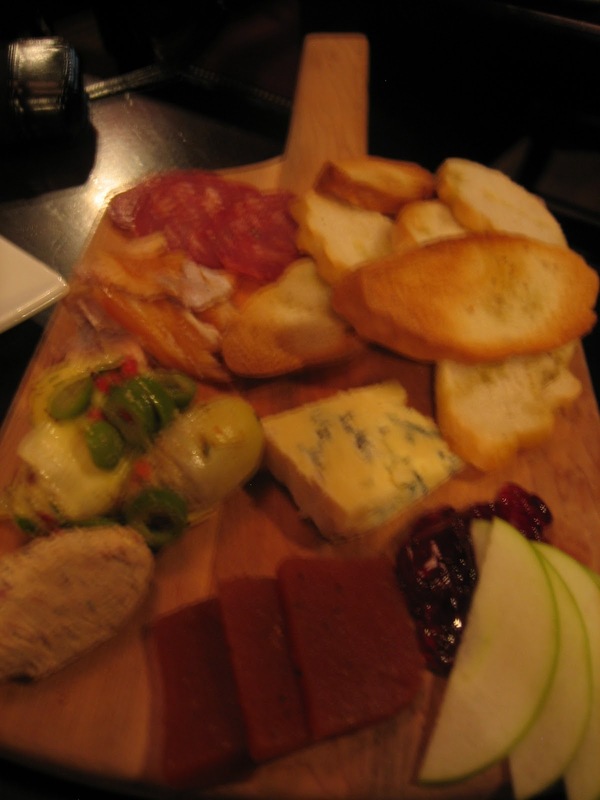 Ploughman's Platter $14 - Smoked fish, cheeses, charcuterie, homemade relish and spread served with toasted bread. Love the presentation of the board and the variety. This would be a good appetizer for a group to share. On the plate were some artichokes, smoked trout, tomato aspic, pate, blue cheese, apples, olives and salami. 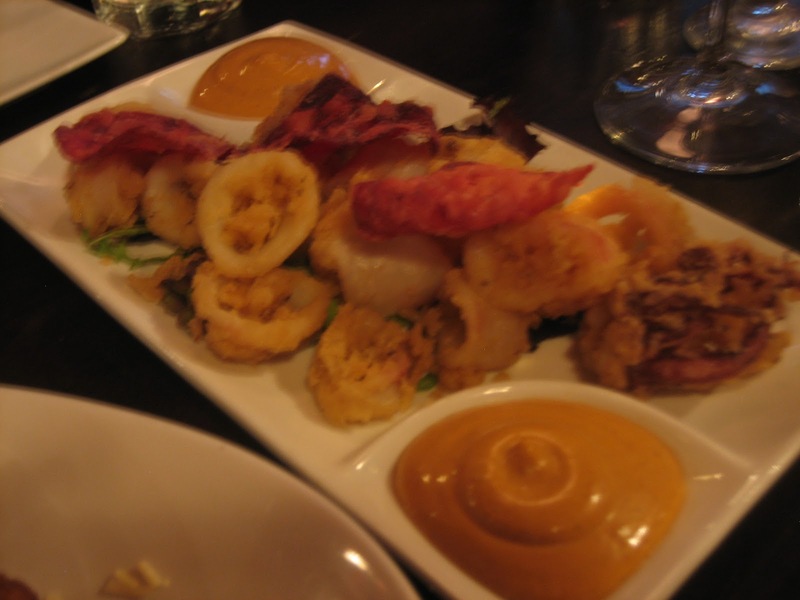 Spiced Cornflour Calamari $9 - The calamari is served with beet chips and smoked pepper aioli. If you love calamari you will love these. They are large in size and the breading doesn't overwhelm the meat. The aioli is a really nice change from the usual marinara sauce and the crispy beet chips are a colorful addition. 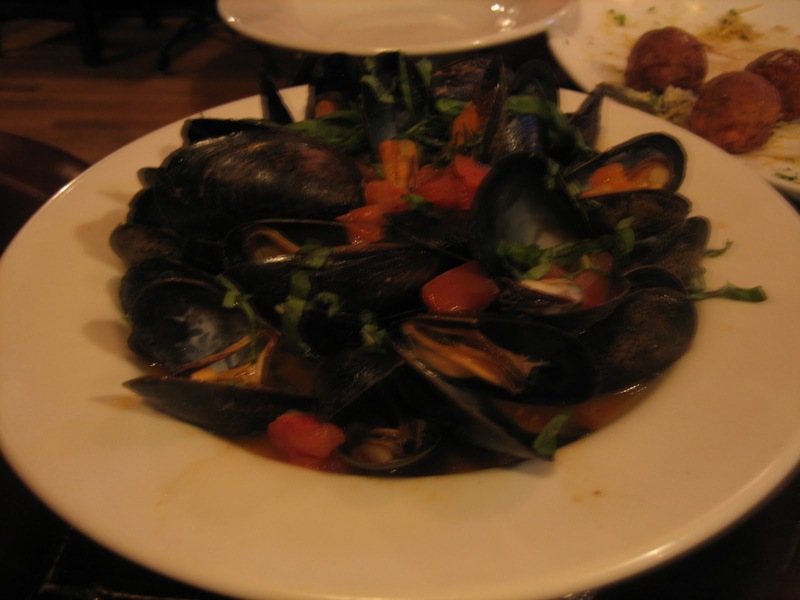 Sauteed Mussels $9 - P.E.I mussels with tomatoes, basil and garlic in a white wine butter. What a large serving of mussels for $9! I love the savory flavoring - it's definitely an appetizer you can eat a lot of without feeling too full (trust me hahaha). Fish 'N' Chips $16 - Two portions of Heavy Seas classic lager battered cod, potato wedges and Slainte slaw, served with vinegar on the side. 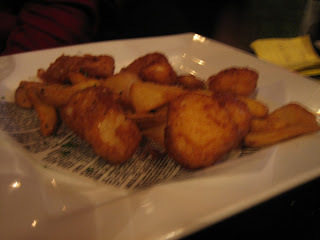 The cod was flaky and moist inside the wonderful breading and the chips had a good amount of crisp to them. The coleslaw was freshly made, was light on the mayo and included lots of pickles and pickle juice. Probably one of the best coleslaws I've ever had! This meal made me nostalgic! Guiness Sunday Roast $18 - Irish pot roast braised in Guinness, served with boiled potatoes and carrots. Straight up comfort food. I hardly noticed a beer flavor, to be honest, I just noticed how much I loved the pot roast and the potatoes and carrots. 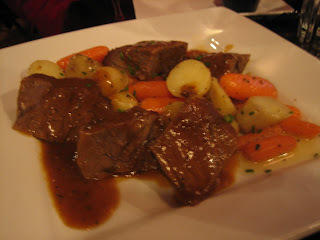 The meat was succulent, the sauce was nice and savory and the vegetables were perfectly boiled. What more can you ask for? Gilled Duroc Porkloin $16 - Porkloin served with herb spaetzel and pink peppercorn goat cheese sauce. Wow. I loved this. The spaetzel reminded me of tiny pieces of waffle fries and I couldn't stop eating them (have you noticed a theme in my review so far? hahahah). The creamy goat cheese dressing is not as overpowering as you would think while the pork itself was light and wonderfully flavored. What an excellent, EXCELLENT dish. Guinness Breadpudding $8 - Breadpudding served with a warm caramel sauce. The pudding was light and fluffy, which is never what I am expecting when I order bread pudding. Our dessert was not served with a warm caramel sauce, but a raspberry sauce instead. I think the caramel sauce would be a much better addition. Zeppole (actually an Italian dessert Chef Bill brought over from his times spent in Sotto Sopra). 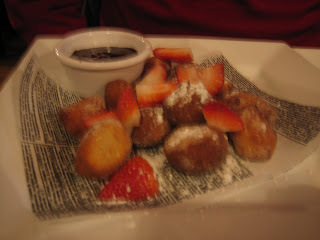 What we have here are deep-fried dough balls (DOUGHNUTS) sprinkled with powder sugar, and served with a cup of chocolate ganache for dipping. The balls weren't too sweet, so the warm chocolate was it's perfect accompaniment. WOW. My tummy was so full at this point in the meal, but I destroyed this plate because my brain would simply not allow me to stop. PURE PERFECTION. GET THIS NOW. SERIOUSLY. I DON'T WANT TO HEAR ANY EXCUSES FROM YOU. Unfortunately, this is not on the menu currently (AAAAAAAAAAH! ), but hopefully they will still offer this every time you go! All in all, I think this new menu is incredible. Of course I will order my Zeppole every time I come here, but I also can't wait to try their Dubliner Cheddar Mac and Cheese which is topped with braised pork shoulder ($13), or their Shepherd's Pie ($12). You can come here and have a great time watching a football (soccer) game with your mates, and at the same time have a delicious dinner with your significant other. 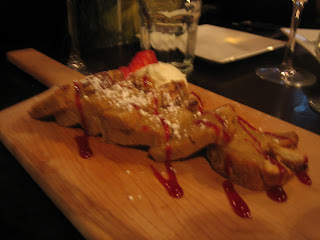 Either way, Slainte is Baltimore's gastropub - go to Fells Point and give it a try! 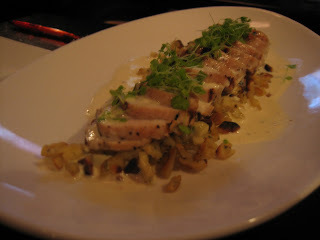 DISCLAIMER: Though this was a free tasting, I still only wrote exactly what was in my heart and tummy about my meal at Slainte! As I mentioned here, Jason's Deli offered their patrons two days of free entrees while they were training their staff. Of course I took full advantage of that! I ordered the JB's Bagelini ($5.29) - Smoked turkey breast, provolone, smoked red pepper-cilantro aioli and fresh made guacamoke, pico de gallo. Pressed between an olive oil toasted bagel. For the price this was a surprisingly good and filling sandwich. I loved the aioli, whereas the guacamole wasn't all that exciting. This is a great lunch sandwich. Dan ordered the Chicken Panini ($7.29) - Marinated chicken breast, provolone, basil pesto with pine nuts, roma tomatoes, spinach. Pressed between olive oil French bread. Now this sandwich was not a favorite of mine. I thought the chicken was overly spiced, which made the entire sandwich too salty. All the ingredients sound great - but something was definitely off. I was able to try a bit of their signature sandwich, the Muffaletta, and immediately wished I had ordered one. If you love olives, you will love this sandwich. Even if you don't even like olives you may very well like this sandwich because the bread is just that good. And look at that plate! That's HALF a sandwich right there!!! You can order either the Ham and Hard Salami Muffaletta or the Turkey Muffaletta. You also have the choice of 3 sizes - Quarter ($6.29), Half ($7.99) or the Whole (9inches - $11.99). The Muffaletta bread is spread with an olive mix and antipasti with olive oil and provolone and your choice of meats. There's no way you're leaving hungry after half of that thing - or even a quarter!!!!! The next day I tried the California Club ($6.99) - Croissant with turkey breast, bacon, swiss, tomato, sprouts, mayo, and guacamole. I decided to get fresh fruit on the side, which was served with a creamy sour cream based dip that I enjoyed. This sandwich was great, I really really liked it, and even liked the guacamole better this time around. 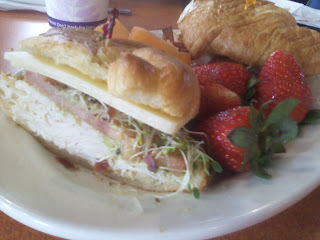 It also made me appreciate how much I love croissant sandwiches, of which there are many on the menu. All in all, this was a great sandwich shop, and I expect it's going to give Panera Bread some stiff competition, considering they are in the same shopping center. The salad bar looked interesting and fresh, and they were also giving out free soft serve - which I heard they were going to continue doing! The space itself is huge and definitely family friendly. All in all, those free entree days worked out well - I can't wait to go back for an inexpensive and tasty lunch and Dan's already been back TWICE!! Yes, it's freezing outside and here I am talking about Tutti Frutti, the new frozen yogurt place in Cockeysville...but how can I not? This place is awesome and we've been waiting for a place like this in the suburbs for a long time (sorry TCBY!). They have so many yogurt flavors and so many toppings that it would be hard to have the same experience twice. Their flavors and toppings are said to change all the time - in fact, they boast 40 yogurt flavors and 40 toppings that they can cycle through, keeping their most popular ones, of course. For my first time I kept it simple and went with the basic vanilla, a bit of chocolate and topped with some oreos and toffee bits. I loved this combination! Sooo simple and creamy! This is a self-serve place - so don't let that spell disaster for you! Their cups are very large and you will feel like you need to fill that entire thing up, but beware - your treat is weighed at 45cents an ounce, and that adds up fast! I love the variety of this place. 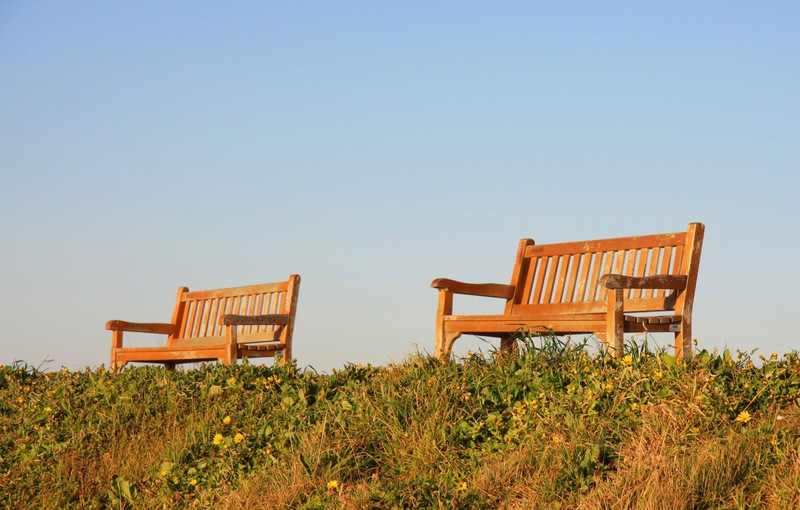 I can see myself coming here often when the weather warms up a bit - you should think about it too! If you remember this post, I wrote about the Foodzie Tasting Box and how my friend thought it was a terrible idea. He suggested I purchase $20 worth of groceries myself....or that he would just buy me $20 of fun groceries so that I would still maintain my surprise. Well, I took him up on his offer and decided to compare his box with that of Foodzie's. So here's my review of the Foodzie Tasting Box. Was it worth $20? To be honest, it's hard to say. I've spent $20 on worse things - Pier V parking comes to mind, in fact. Just as I imagined, I did love the surprise of opening the box and seeing what was inside, but so far I am not impressed. The almonds were OK....they tasted like almonds. The mini cupcakes were a bit dry. The dried nectarines were like dried apricots gone wrong. The granola bar tasted like eating bird food. I still haven't tried the dulche de leche or tea yet. So, yes, this box failed me. I did like that it gave me the opportunity to sample items I would have never bought on my own....but perhaps that is a problem? I'm not going to write the Foodzie Tasting Box off completely though, I think every once in a while it would be a fun treat, but I'm not sure I would ever subscribe for a year's worth of boxes. 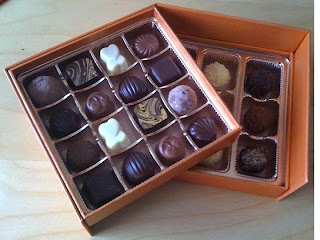 It certainly seems that my friend has a very good chance of winning the Tasting Box Challenge. I think even another friend wants to get in on this as well. This may be the greatest challenge of my life, and I mean that in the AWESOME way. 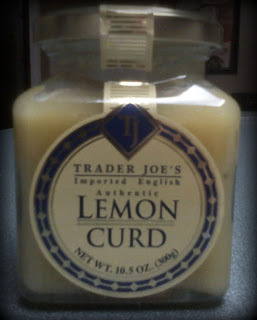 I received a lovely jar of Lemon Curd from Trader Joe's as a gift, but unfortunately I have no idea what to do with it. Does anyone have some ideas/recipes that uses lemon curd? Yes, yes, I know I can Google it - but this is more fun :) Thanks! 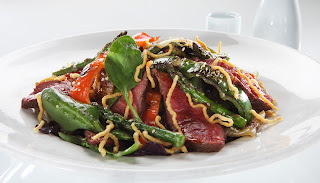 Otoko Salad (Chicken $10/Beef $12) - Choice of grilled chicken or beef tossed in a spicy yuzu dressing with grilled red and green bell peppers, onions and asparagus. It's served over some greens with a rice wine vinaigrette and topped with watercress and fried ramen noodles. I really liked this salad - it was a great starter and the yuzu dressing was nice and spicy. I would recommend the beef. Pacific Roll ($9.50) - Spicy mix of albacore tuna, cilantro, jalapeño and cucumber, rolled and topped with fresh avocado and mango salad. Finished with red beet tempura bits and sauteed cashew nuts. 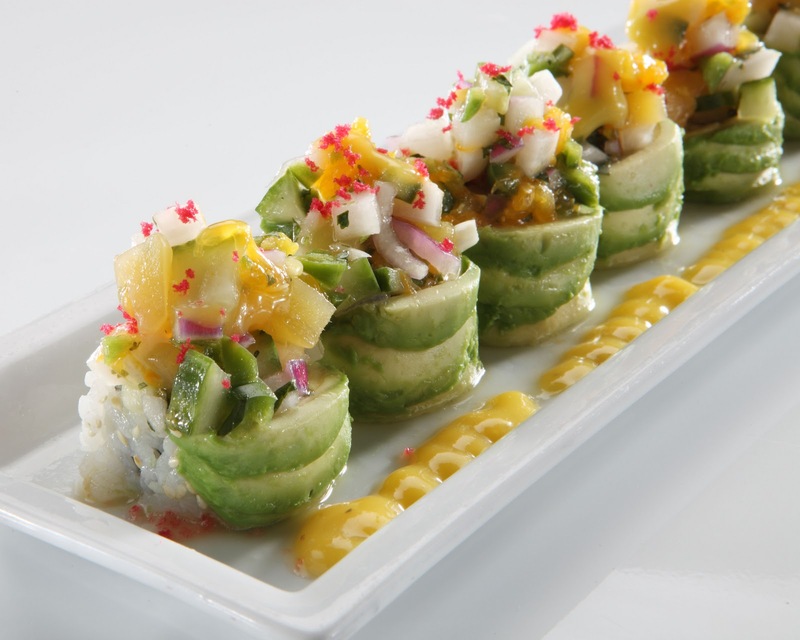 Tropical Roll ($8.50) - Cucumber, mango and avocado rolled and topped with spinach tempura bits, spicy shrimp mixed with masago and mango salsa. 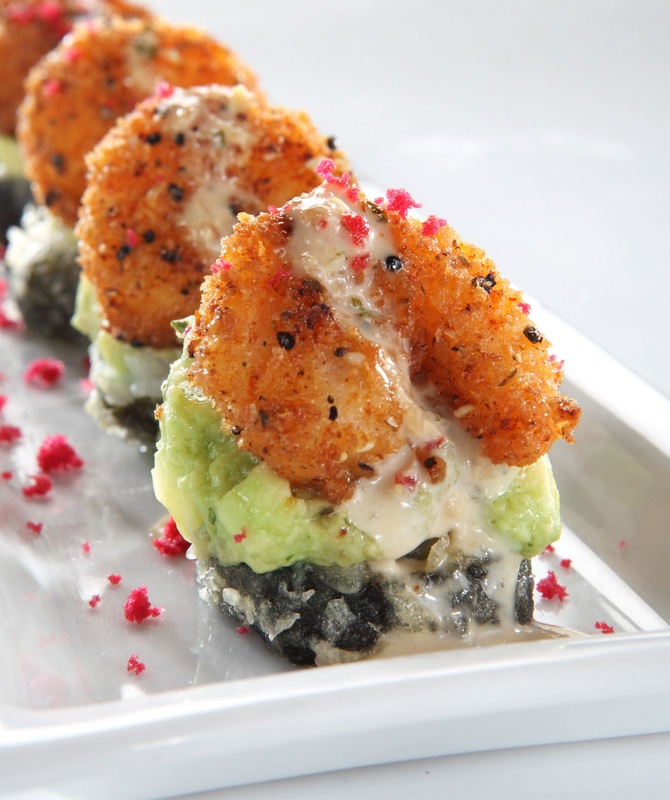 "RA"ckin' Roll ($13) - Crab and cream cheese rolled in rice and seaweed, lightly tempura battered and topped with guacamole and "RA"ckin' shrimp. It's finished with a creamy ginger teriyaki dipping sauce, red beet tempura buts and togarashi. Vegetable Tempura Roll ($7.50) - Lightly battered asparagus, sweet potato and Japanese eggplant rolled and topped with crunchy tempura bits and drizzled with a sweet eel sauce. Interestingly enough, the Vegetable Tempura Roll was my favorite out of all of these, although that's not to say that I didn't love any of the other options. I thought they were all tasty with a lot of complex flavors. In fact, the "RA"ckin roll actually reminded me of risotto - which was interesting for a sushi roll! But what I loved about the vegetable roll is that I could identify all the flavors, and they worked so well together. I would love to order this again and again. 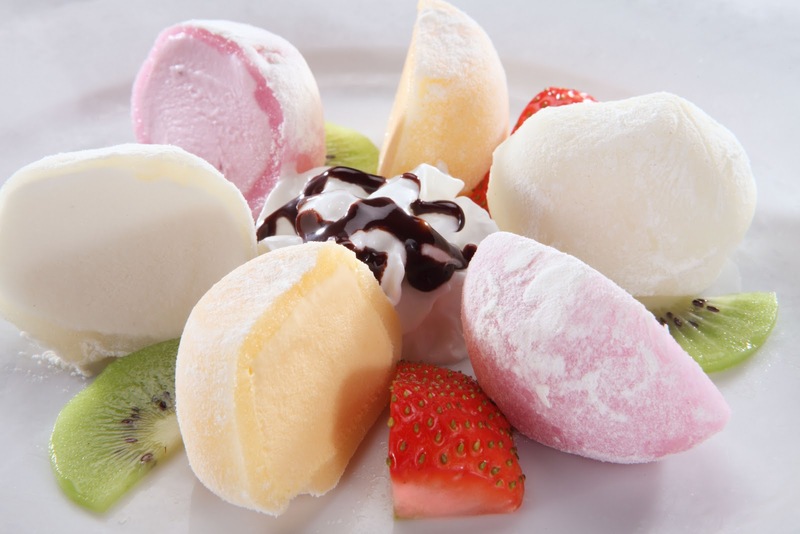 Sweet Mochi Trio ($7.50) - A traditional Japanese treat. This is a combination of mango, strawberry and vanilla ice cream wrapped in sweet rice cake. Yes!!!! Mochi!!!!!! I loooooove this stuff and was so happy that this was added to the menu. Although I only got to try the strawberry flavor, it did not disappoint me. The chewy outer layer and creamy ice cream was perfect. Ginger Blossom ($8) - Hendrick's gin, St. Germain, muddled strawberries, pink grapefruit, lime juice and a splash of ginger ale. Elderflower Smash ($8) - Absolut Berri Acai, St. Germain, muddled blueberries, lemon juice and soda. Dragon Bite - Bacardi Dragonberry, strawberry puree, lemon juice, yuzu and a splash of soda. I love how inventive these drinks are - they match the menu perfectly. Of course there are many more new menu items, as well as the old ones as well. I think this place is great - everything is so creative! If you haven't been to this place before, go for their happy hour (Mon-Sat, 3-7pm) and you'll be hooked! Thanks to Profiles, Inc. for their wonderful photos! DISCLAIMER: Though this was a free tasting, I was not asked to write a positive review nor did I feel any inclination to write anything which did not reflect my true opinion of Ra Sushi.